Most of us got plenty of practice in elementary and middle school with commas and capitalization. We thought we were on secure footing until freshman English. At some point during that year, our English teacher tossed out a copy of E.B. White poetry and everything we learned about punctuation went out the door. 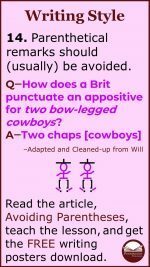 Besides, we started reading articles and plenty of other expository text with weird things like semicolons, colons, acronyms, and plural possessives with strange apostrophe placements. Who thought there were actual rules about dashes, brackets, parentheses, and such? And don’t get me started on parentheses. All we knew was that our frosh English teacher loved to use that red pen for the “other punctuation” and grammar rules. We needed, and most of us still need, a bit of help. Here’s the 22 other punctuation rules from The Pennington Manual of Style to give you the help you need. 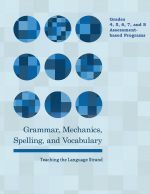 Want the whole manual including 22 comma rules, 22 capitalization rules, 22 other punctuation rules, 22 quotation marks, italics and underlines, and 22 Modern Language Association (MLA) citation formats? 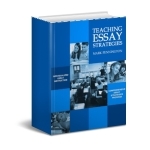 The author (authority) of these mechanics rules is Mark Pennington, publisher of Teaching Essay Strategies designed to teach students the Common Core W.1 argumentative and W.2 informational explanatory essays with downloadable e-comments, and the newly released Grades 4-8 Grammar, Mechanics, Spelling, and Vocabulary (Teaching the Language Strand), designed to help students catch up and keep up with grade-level Standards in grammar, usage, mechanics, spelling, and vocabulary. 1 Singular Possessive A possessive is a noun or pronoun that serves as an adjective to show ownership. For a singular possessive, place an apostrophe at the end of the noun and add an s. Example: His mom’s cookies are the best. Don’t use an apostrophe with a possessive pronoun (yours, his, hers, ours, yours, its, theirs). Examples: That plate is your’s. Revision: That plate is yours. 2 Singular Possessive Ending in s or /z/ When ending in an s having a /z/ sound, place an apostrophe, then an s, or simply end with an apostrophe. Examples: Charles’s friend or Charles’ friend is fun. 3 Singular Possessive Gerunds A singular possessive noun can connect to gerunds (verb forms ending in “ing” that serve as sentence subjects). Example: Joe’s cooking is not the best. 4 Singular Possessive Indefinite Pronouns Place the apostrophe before the s for singular indefinite pronouns. Examples: Now it is anybody’s, everybody’s, somebody’s, somebody else’s, either’s ballgame. 5 Plural Possessive without s Ending For a plural possessive of a singular word that doesn’t end in s, place the apostrophe after the s. If the singular and plural forms are spelled differently, place the apostrophe before the s. Examples: The girls’ team is good, but the women’s team isn’t. 6 Plural Possessive with s Ending For a plural possessive of a singular word that does end in s, add “es” and then the apostrophe. Example: Our stove worked better than the Thomases’ stove. 7 Plural Possessive Joint Ownership When two or more words share joint ownership, the possessive form is used only for the last word. Example: Matt and Suzanne’s wedding was the social event of the season. 8 Plural Possessive Individual Ownership When two or more words are combined to show individual ownership of something, the possessive form is used for each of the words. Examples: Linda’s, Christie’s, and Wendy’s dresses were each individually designed. 9 Period after Initials and Abbreviations When ending declarative and imperative sentences with initials and abbreviations, use one period. When ending interrogative and exclamatory sentences, keep the period and add the question mark or exclamation point. Examples: Is he John, Jr.? Viva U.S.A.! 10 Acronyms An acronym is any abbreviation formed from the first letters of each word in a phrase. Most frequently used acronyms do not require periods. Example: HTML (Hyper Text Markup Language). 11 Contractions A contraction is a shortened form of one or two words (one of which is usually a verb). An apostrophe takes the place of a missing letter(s) at the beginning, middle, or end of the word. Examples: ‘Tis almost Halloween, but don’t light the jack-o’-lantern yet. 12 Semicolons Use semicolons to join independent clauses with or without conjunctions. Semicolons combine related phrases or dependent clauses. Example: Anna showed up late; Louise didn’t at all. 13 Colons with Ratios Use colons to show a relationship between numbers. Example: At 8:02 p.m. the ratio of girls to boys at the dance was 3:1. 15 Colons in Business Letters Use colons after business letter salutations. Example: To Whom It May Concern: Thank you for your employment application. 16 Colons with Independent Clauses Use colons at the end of an independent clause to introduce information to explain the clause. Example: This is the most important rule: Keep your hands to yourself. 17 Exclamation Points Use one exclamation point at the end of a word, phrase, or complete sentence to show strong emotion or surprise. Phrases or clauses beginning with What and How that don’t ask questions should end with exclamation points. Examples: Wow! How amazing! The decision really shocked me! 18 Parentheses as Appositives Use parentheses following words as appositives to identify, explain, or define. Dashes or commas can serve the same function. Examples: That shade of lipstick (the red) goes perfectly with her hair color. The new schedule (which begins next year) seems confusing. The protocol (rules to be followed) was to ask questions after the presentation. 19 Parentheses with Ending Punctuation Ending punctuation never is placed inside of parentheses, even when the parenthetical remark stands on its own as a complete sentence. Examples: I want that Popsicle® (the orange one). He was crazy. (He didn’t even know what day it was). 21 Brackets Use brackets before and after words or ideas to make them more clear. Brackets add explanation or necessary background knowledge for the reader. Examples: George Washington [1732-1799] was gracious to Lord Cornwallis [the British general who surrendered at Yorktown]. 22 Hyphens Use hyphens to divided words at syllables when more space is required at the end of a line. Also use hyphens to join words that are necessarily related, but are not compound words. Don’t capitalize the letter following the hyphen. Example: We read a spine-tingling story in English-language Arts.